This is the first of three blogs I’ve shortlisted to share with you from many more Year 2 and 3 Textile Design Degree students at Falmouth University. I had the pleasure to hear each student present their project and then have a one to one tutorial, asking them more questions about their project, objectives and strategy as well as offering them advice on how to improve their craftivism project to have more impact before the final deadline. Here is one of the three strongest final projects presented, created by Lucy Stride, a second year Textiles Design student. I hope these three blogposts encourage you in your craftivism, show you how people have thought through their strategies, who they are targeting as an audience, their clear and realistic objectives and how to execute them through their craft. These blogs also remind us all of the variety of craftivism projects that can be created and have a positive impact. Lucy, how did you get into Craftivism? Growing up I have always found art and craft as a sort of therapy in which you express your thoughts and ideas. Craft is the way I make sense of the world around me and my place within it. As a student I always find myself engaged by a project that allows me to convey messages about issues and subjects I feel very passionately about. You can therefore imagine my delight when I was set the Craftivist Collective brief at the beginning of my second year BA (Hons) Textile Design course at Falmouth. 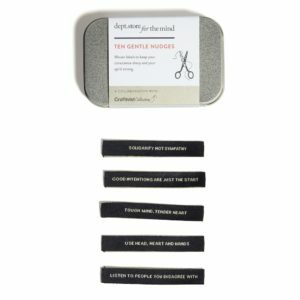 The brief introduced me to the Craftivist Collective movement, allowing me to discover how craft could be used tackle issues we face in society today in a fresh innovative way. 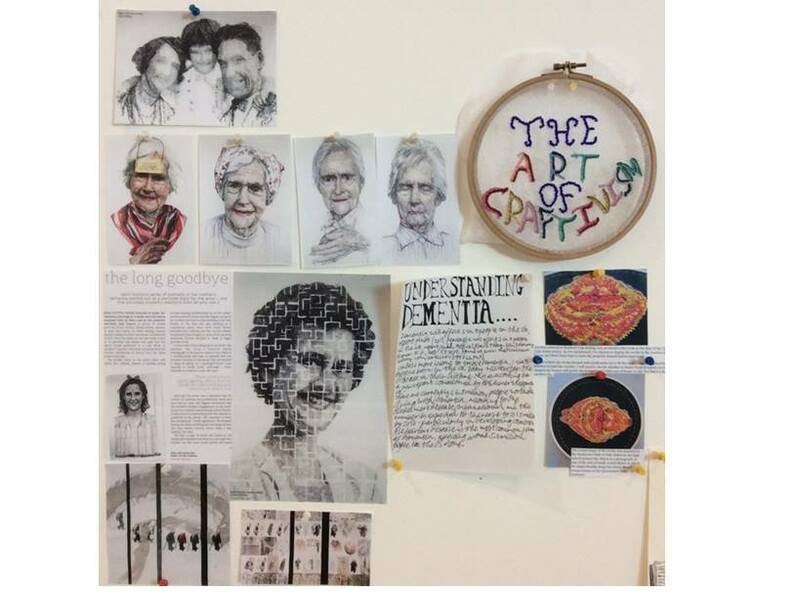 The founder of the movement Sarah Corbett has planted a seed of inspiration and prompted me to think about how the combination of craft and activism can allow me to provoke thought and awareness about the social issue of dementia. “One day I opened the fridge and found grandma’s handbag”. Photographer: Lucy Stride. The purpose my project is to illustrate the personal stories of my Grandma Dorothy who was diagnosed with dementia at the age of 71 and passed away when she was 81. Showing how dementia affected her behaviour in the early to later stages of diagnosis is the primary focus in my project. By sharing these stories I intend to raise awareness of the importance of recognizing the early signs of dementia. I want to encourage my audience of savvy 18 to 30 year olds to increase their level of understanding when it comes to dementia and therefore know how important it is to spot the signs and screen early. In society today I want to show by taking the time to understand each patient’s story it can help us to understand their behaviour and we can as a result give a dementia patient the support and respect they deserve. I have shared my encounter with grandma’s dementia behaviour but I now I want to invite others to share their stories from another perspective. Talking about the signs and not being afraid to speak up is key to understanding how it can affect anyone from any walk of life. We can then give someone with dementia the support and love they need to live happily. Let’s fight the fade together. Preferably I would like the viewer to respond to my work in way that stimulates further discussion and awareness prompting people to be more mindful and reflective of the way dementia affects the patient. The much needed support of family or friends who have dementia can then stem from these discussions. The content of my stories are also intended to look at dementia behaviour from a light hearted perspective. Sometimes coping with dementia is about finding the humour in the way it can cause the patient to act. When faced with a puzzling situation sometimes it’s better to laugh than cry. To this day it still makes me laugh when I picture the confusion on my mum’s face when on numerous occasions the hunting for grandmas handbag took place only to find it somewhere like the fridge. The importance of sharing the everyday encounters with dementia can be a way we grow in our understanding of the disease. If we can find the positivity within it could be a great coping mechanism for many people. I am hopeful my stories will encourage people to open up and share their own experiences and not be afraid of the unknown or bottle up their worries and concerns. I would also like to prompt people to take the time to learn more about dementia whether they research online (www.alzheimers.org.uk) or consult a doctor if you have any concerns. This will hopefully provide the knowledge people need to spot the signs and screen early so someone with dementia can get the support they need to live a contented life. 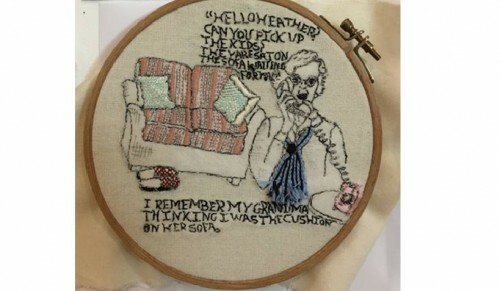 “I remember my grandma thinking I was the cushion on her sofa”. Photographer: Lucy Stride. What do you think about when stitching? I thought about how well my mum and my aunty supported my grandma when she was in the early stages of diagnosis. They showed my grandma love and kindness as well as showing a level of understanding for the disease. They went out of their way to provide grandma with the support she needed which is such an admirable thing and will never be forgotten. As I was stitching the thought that played in my mind was that if someone can relate to the stories of my grandma’s dementia behaviour my hope is that they can provide a loved one with the support and love my grandma received so other dementia patients can live happily. 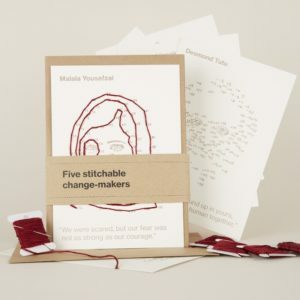 How will craftivism change the world? Through craftivism we can approach the use of art and craft in a unique targeted way which is intentional, thought provoking and has integrity. It cleverly uses skills and visuals as a way of communicating a message some would argue in a more effect way then dominating activism. I believe visual craft projects stay in your mind for a long time particularly when produced in such an innovative unusual way. We need craftivism as it gives many people the opportunity to speak out in clear way when they struggle to find a voice. 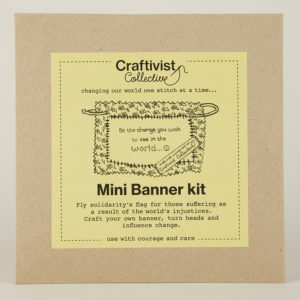 Craftivism gives us the chance to bring fantastic skills and expression to campaigning which is beautiful and displays a real passion and connection to an issue. All the craftivist projects are key steps on a journey which will lead us to the change we wish to see in the world. Projects like the Craftivist Collective projects remind me how strong and brave the world can be when we aspire to take leap of faith and make a stand which I’m truly privileged to be a part of. Finding the Craftivist Collective has really opened up my eyes to how liberating and purposeful art can be when we dare to stand up, think outside the box and use our skills to change injustice…..
I’ve always connected to artwork more powerfully when art is used to provoke and express messages. For me I only produce my work effectively when I’m passionate about the context. In my art foundation year at college I started a project which was about raising awareness of cancer for my final major project exhibition. I created an art installation piece using soft sculptured textiles and showed a world under the microscope depicting cells inside the body. From this point onwards the idea of crossing textile art with science and health issues greatly inspired the themes in my art. I knew I wanted to focus on this. I however found myself wanting to make a difference and going beyond producing art for a project. Caring for others and offering compassion in this confusing world with all its difficulties is for me massively important. I even hope to go on to study as an art therapist where art can help people express things they cannot put into words. The Craftivist Collective offers me the chance to change how people with dementia are cared for, how they are treated, and how important it is to show them love. For that I am grateful. Help support dementia by sharing this blog on social media and include @craftivist #supportdementia. “My Craftivism” is a series: We love hearing what benefits they see in craftivism, what their ‘crafter-thoughts’ where whilst stitching & what they are going to do with the project they have joined in with. It can really inspire us all, challenge us and hopefully get us all thinking about what is effective craftivism and how we can help each other be the best craftivists and global citizens we can be. If you would like to share your craftivism piece or event with us please do email us at hello@craftivist-collective.com for more info. If you find this post useful and can support us to continue to provide free content people support us. 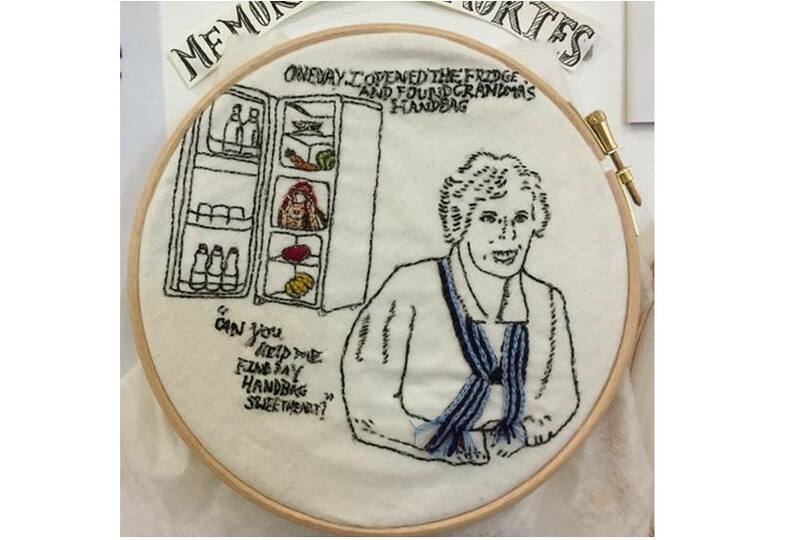 Why not have a go at some craftivism yourself?